Has anyone won a Big Fish ticket yet,I just spin now not expecting to win. This is my first such valuable prize. I spun and got two lucky chip tournament tickets. I won two tickets worth $16.5 and $33 in the wheel of fortune. I used a $16.5 ticket and got a $90 prize. I haven't used another ticket yet. I win tickets only to the 1.5k freerolls. I've played every day since they started this promotion, usually two spins a day, and all I've won are tickets to the $1500 GTD. I got my ticket tonight. They sure don't last long do they. I have just 6 days to use it. I have long been on the 888 did not come, last time nothing came though the ticket is in fact should get. 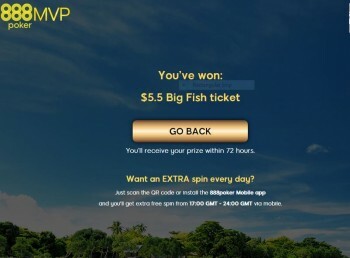 Yes, I won a ticket to Big Fish at 5.50 in 888, then I played in this tournament but did not get into the prize zone and I'm hurt, but I will continue to play and try to win more tickets, and maybe lucky to win something in such tournaments ! I used my ticket this morning and after over 4 hours went out in 53rd, cashing for $19.35. The key hand was an 8-2 offsuit in the BB in an unraised pot. The spin gave me two lucky chip tickets tournament.I had bad luck because I wanted the 5,50 big fish ticket. I have tried every day and yet to win a big fish ticket. Yes it is nice of 888 keep on spinning guys good luck. yeah it is nice spinning at 888poker. free rolls are pretty good. I like those tickets we get. tournaments don't last as long I like the time frame for the whole tournament is over at a decent time. other free rolls could last for hours but I like the 3 min blinds I know you have to make a move. Yesterday I got a ticket again at 5.5. I really like it. I am glad. Finally won my first $5.50 Big Fish ticket! Haven’t played yet, but I’m definitely looking forward to this 15k GTD! Got my 2nd Big Fish ticket on the spin today, this time a $16.50 ticket. I hope this one is as good for me as the last one. I try to spin everyday, and on average 1 time a week I get these two 1500$ Lucky tickets. I started playing 888 poker, about two weeks ago. And for all this time, I received only four tournament tickets for $ 1,500. Unfortunately, nothing more. I used my 2nd $5.50 Big Fish ticket today and finished slightly better than I did with my first ticket. It's a nice chunk for free money, but it sure is time consuming, over 4 1/2 hours. I win a lot of satellite tickets with the freebuy tournaments but keep losing with the best hand when playing for the bigger tickets with the wheel lose or 1.5 tickets. I have won this prize of the $5.50 big fish ticket. I did not think it was possible without having the MVP status like the others who have spun this prize. The majority of the time I spin either nothing or tickets to $1500 lucky chip. I have got a few of the bigger grand hand/royal freeroll aswell.. but not many. Sometimes also get Casino Freeplay or 3$ sport bet. I have won 3 big fish tickets up to yet. I have already used $5.50, $16.50 and $33 tickets. I did win $ 94 in $33 tourney but no returns in $16.50 and $5.50 tourney. Wow.. the $5.50 Big Fish Ticket again!! I have not even used the first one I got a couple days ago. I spin and all I get is nothing , sometimes I get 1500 ticket, once I have won 3 dollars sport bet . The wheel has been very good to me this month. Good prizes have been $5.50 and $16.50 bigfish, the $1 BLAST, and a $3 Sports Bet. Now hopefully I can win something on the bigfish ticket.